Well, it’s been months since our holiday and I will finally make an attempt at writing about our visit to Troy. I have so much I want to say about Troy, and it’s a bit overwhelming, which is why I haven’t written anything for ages! I just don’t know where to begin. We’d wanted to visit Troy for quite some time since it’s relatively close to Istanbul and also because Richie and I both really love the Iliad which is set in Troy. 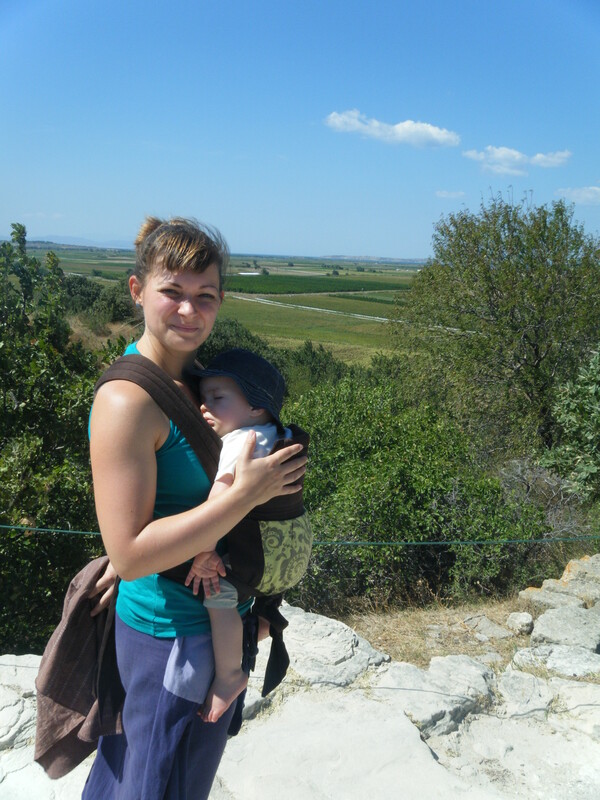 In fact, we named Liam after one of the heroes of the Iliad– Odysseus (the Latin version is Ulysses, which is Liam’s middle name)- so we thought that bringing Liam to Troy would be a ‘pilgrimage’ of sorts, so he can one day say he had actually been to Troy, even though he obviously won’t remember much from our journey there. Actually, just as we arrived at the site, Liam got very cranky, so I was walking around with him in his carrier to get him to sleep for a bit. He ended up sleeping through everything and, as it was extremely hot and sunny, my mission was basically to shelter him from the sun as much as possible and keep moving so he’d stay asleep rather than waking up and screaming his head off through the entire tour. Not the most relaxing experience for me, but I’m still glad I got to see Troy! Anyway, I digress. So, rather than getting into all my deep thoughts on the Iliad, I’ll just give a bit of information about the historical city of Troy for now, otherwise at the rate I’m going, it’ll be years before I get any more blog posts published! The ancient city of Troy (also known as Ilios, which is where the title of the Iliad comes from) was located in north-eastern Anatolia in what is now Turkey, on the shore of the Dardanelles/Hellespont, a strait that connects the Mediterranean and Aegean Seas to the Marmara Sea and ultimately to the Black Sea. This was an extremely important shipping route in ancient times, as it still is today. Troy was in a perfect position to control shipping through the strait which made it a strategically important and extremely wealthy city. The city was built and rebuilt many times over centuries and suffered through earthquakes, wars, fires and the mass slaughter of its people at different points in time. The original city may have been founded around 3,000 BC, during the Bronze Age, and was inhabited by different peoples at different times, then eventually declined and disappeared during the Byzantine Era. The area around Troy is a huge archaeological site, only a fraction of which has actually been excavated at this point. While the epic events of Homer’s Iliad may be entirely fiction, it was still interesting to see some of the ancient features of the site and imagine what it would have been like in its prime. The city was obviously inhabited for thousands of years, and layers of construction were built on top of each other over time, so what we saw were bits from many different eras of the city. 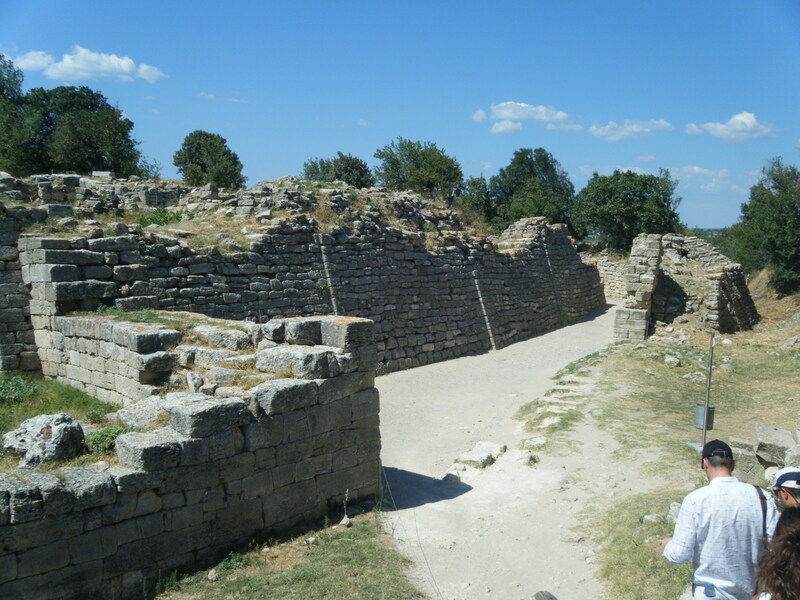 Among the sights were the walls and an entrance to the city, beautiful ornate sections of what was a temple to Athena, numerous altars in a sacrificial area, a ramp leading to another entrance to the city, the foundations of a house, and a small amphitheatre. Perhaps just as impressive as the ruins we saw was the view from the hill where Troy once stood. 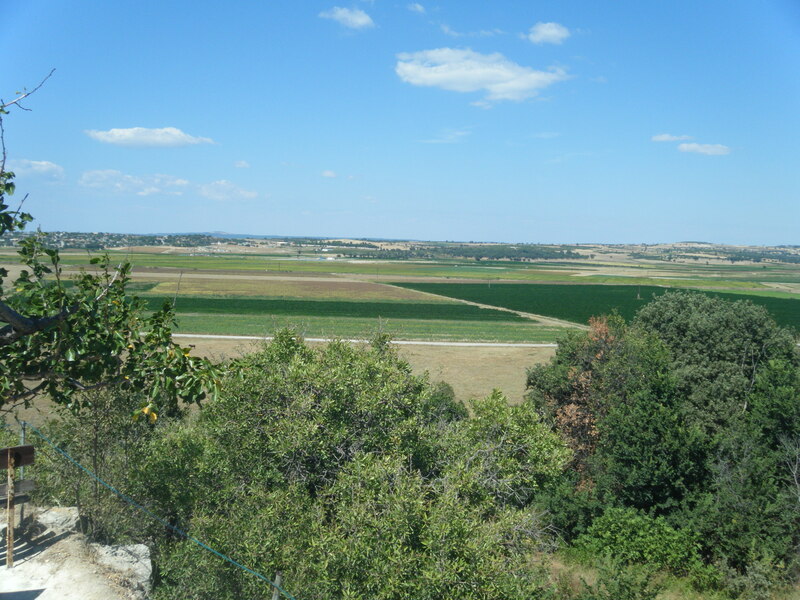 Lovely fields of sunflowers, olive trees and corn stretch for miles around and you can also see the waters of the Dardanelles strait sparkling in the sun. The guide pointed out some large earth mounds which were burial mounds, perhaps just like the final resting places of some of the Iliad’s great heroes, Achilles, Patroklos and Hector. While standing on the hill, gazing out over the patchwork greens and browns of the plain and the blue waters of the Dardanelles, one can imagine what it must have been like for the inhabitants of the city looking out from the walls as enemy ships from distant lands arrived on the shores. From that spot they would have watched day after day as their loved ones fought on the field to defend them from the invaders, seen the chariots, weapons and armour glinting in the sun, wondering if those brought back dead or wounded were their own husbands, fathers, brothers. Each day they would have watched and wondered what their fate would be; would their heroes be able to repel the invaders or would those enemy warriors one day arrive victorious at the gates. The stakes were impossibly high; defeat would mean the men slaughtered and women and children killed or taken to distant countries as slaves. So whether or not it was the mythical Helen, Priam or Andromache, we know for certain that someone watched the encroaching doom from those walls, though their names are now lost to history. Well, eventually I’ll write more about the actual Iliad, which I absolutely think is one of the best pieces of literature ever written. It is beautiful and amazing and there’s just so much one could say about it. But for now, here are the photos from our trip to the city that inspired that most epic of stories! 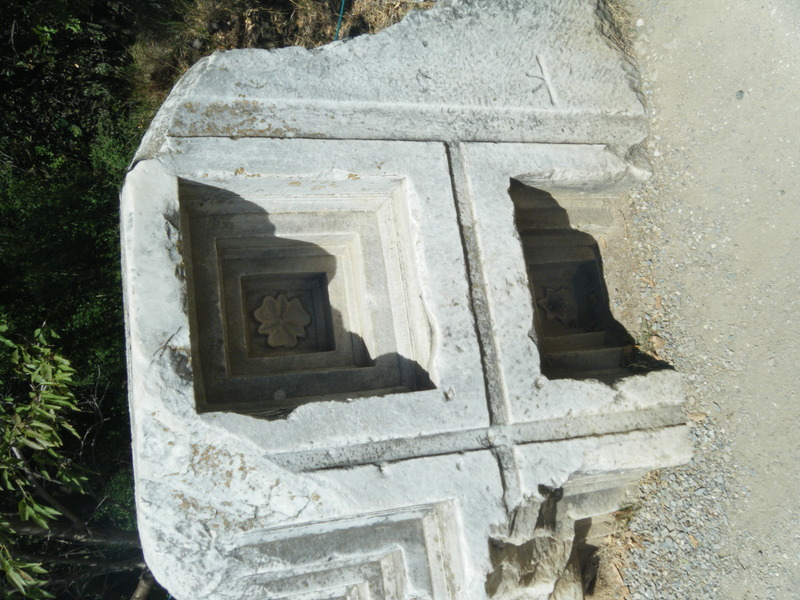 This entry was posted in around Turkey, history, holidays, Liam, travel and tagged Iliad, Troy, Truva. Bookmark the permalink.